I think anyone online right now anyone just paying a little bit of tension knows when the United States says that they’re going for democracy in a country and they need to do it through military means understand. Not true and we’re getting closer to of course more saber-rattling more bigger conflicts between countries were testing each other’s hegemony on the world stage predominantly Russia China and the United States there’s a bigger thing happening here that of course the mainstream media is going to tell you Trump is controlled by Russia. Trump and Putin are best friends in their besties and they kiss each other that’s what the mainstream media is pretty much studying out there as their main idea on the global World stage things look completely different and this has been exacerbated with of course the United States just. Few moments ago getting out of the INF treaty a very important treaty that was set up during the Cold War that pretty much stopped the arms race stopped countries from developing nuclear weapons and many political at analyst. We’re looking at this closely say that this is kind of the revision of the cold world Cold War becoming more of a reality and what we have been seeing by The Establishment on all the mainstream media is just more pushes towards these bigger conflicts towards these more heated relationships. It’s more evident than ever especially in the Senate where the US Senate just voted 68 223. Even withdraw troops from Afghanistan and Syria now it will be interesting to see how Donald Trump reacts to this since Donald Trump again as we covered in previous videos on this channel this is not just a pro or anti war constancio this is a very complicated situation that we’re dealing with your I went into detail with that on the last geopolitical video on this channel but with the Senate rebuking Trump on Syria and Afghanistan Trump is still pushing forward with a bigger conflict with Iran and also specifically bigger tensions with Russia which have been continuing and happening to the madness. All the mainstream media that Jason has absolutely lost it look what Rachel Maddow has been staying on her broadcast during the supposed polar vortex that hit the Midwest we have a couple are we got a whole clip here we go. On the coldest day in recent memory and it wasn’t in our power whether or not to turn them back on. Temperature in your front yard. Possibility of Russia hacking us using the polar vortex as an opportunity to scare people to make people hate other people in a foreign country for a bigger political effects terrorizing of course we just pure speculation speaking of behavior this is not journalism that’s not what you’re supposed to do when you’re a journalist. Hyperbolically speculating that reaches going to be giving us a technological hack attack to freeze people to death in the midwest this is fear-mongering 2.0 I’m just another ridiculous insane level which Wikileaks called out and said quote u s largest audience TV host MSNBC Rachel Maddow. Democratic party aligned at this evening said Russia will freeze you and your family today. That’s not a hyperbolic statement Rachel Maddow was actually defending this on Twitter she’s saying you mad? And talking about intelligence agencies and their reports of a possible Hack That Russia and China May. Commit our national grid is vulnerable but again this is the same information from the same intelligence agencies that told us that there was weapons of mass destruction in Iraq and them the same intelligence agencies that I’ve been working with the mainstream media to sell that lie to the American people that has been sold successfully and has ruined over a million people’s lives on this planet so again just another corporate nasty military industrial complex opportunity to. Proliferate bigger conflicts between people from opposite sides of the world full of course monetary and political gains and this is only going to increase width of course what people are saying start of the arms race with of course Donald Trump and the US Administration getting rid of the INF treaty which of course must have responded saying that they would retaliate against for this pull out of this bigger treaty that has just happened again this is why people are saying we are going back to the Cold War and it does not surprise me as of course we are seeing what looks like US military helicopters literally head to the border of Venezuela right now against this video hasn’t been confirmed this doesn’t look like US military airplanes we do know that John Bolton literally. Notebook with five thousand troops to Columbia like shoving it all to the mainstream media we know Israel sent troops to Brazil and if you’ve been watching this YouTube channel when I was in Columbia just a few weeks ago I report. But there has been big talks within the mainstream media there within the government there of Colombia and Brazil invading. Of course Venezuela and starting a bigger called. As that is happening of course we have. Countries all around the world backing this it’s also important that some countries of course don’t back this and back more dialogue but Williams on the United Kingdom. With elected representatives meeting with Henry Kissinger and then right afterwards calling for a coup d’etat in Venezuela. All of this is happening as of course Twitter Facebook and other social technocratic Giants or squashing down and getting rid of voices from Venezuela who do not want this to happen as the New York Times as running literal. There needs to be a bribe of the Venezuelan military in order to overthrow Nicolas Maduro now if you’ve been watching our video footage if you’ve been watching. My reports on the ground I am definitely not a fan of Maduro but realistically hear the bigger argument that has to be made here with a high but I have been seeing with us sanctions with us tough talk again. That those actions have actually been having the opposite effect and have been in power owing him that what we also see here is also video coming out that hasn’t been corroborated hasn’t been verified because there’s been a lot of pics of been a lot of manipulation there’s been a lot of this information about this specific case but there is videos allegedly showing Riot police refusing to disperse the crowd refusing top down orders to get rid of a major protests that happened in the city of barkis can bestow if this is confirmed we will report it I will report it on my Twitter account again has been confirmed but this is a shift and it’s showing that the likelihood of a coup d’etat is very very possible here will it be a military intervention I would say the chances of that are about 30% Russell. But I’ve been studying investigating but we are seeing moves by Maduro who is now proposing an early parliamentary election in Venezuela at as we know a big push against. Maduro has been made when he. Pretty much got rid of the National Assembly that was in there country that refused. 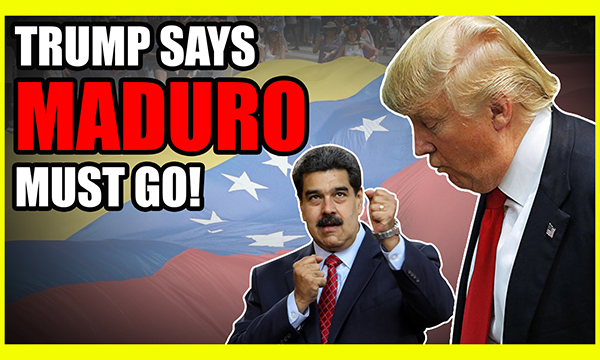 This has led to a lot of criticism this has led to the current situation we now see Maduro backing down. Concessions to the protest groups but will this be enough. From what I’m seeing right now 30% chance of a coup d’etat just from my own analysis and my own studying of the situation and for most of the people that I talked to on the ground right now in Venezuela again not a fan of Maduro but trust me. What US intervention the situation is only going to get rich. But this definitely needs to be done by the will of the people and no one else to be done right and not to cause more pain and suffering. NextWhy Is Everyone Upset With Joe Rogan?